I try Kodi 18 this night. The 64 bit edition is really fast to start and seems stable ! I remark some bugs (like a scroolbar not at the right place after switched windowed/fullscreen mode) but nothing really bad for now. I still like Estuary but I still find that the thumbnails on the home are too big, it was smaller in old versions so it could be nice to be able to choose your own thumbail size because the feeling and visibility are not the same with different screen size. No legal game streaming thanks to the Internet Archive’s Retro Gaming Library !? No game streaming from another PC thanks to steam technology or limelight from nvidia ? The very old extension "Rom Collection Browser" was available since many years in Kodi and support roms scraping and playing... May be "Rom Collection Browser" still complementary to "retroplayer" to have scrapping or scrapping is scheduled for future versions ? It doesn't fix the legal problems due to the bad use of Kodi (yes retrogaming is a really big market and it has no future with the next generations so it's now or never). Furthermore there are a lot of competition in this sector (retropie,recallbox,launchbox,lakka...) so what's the point of developping this functionality ? I also like the idea of the headless kodi. There is a docker project out there (search for kodi headless) to do this but it feels like a hack instead of something native. Reading through other threads though I don't think this is a priority to them. I currently have to run 3 versions of kodi on my home server VM just because the watched status for each profile is not stored individual in the same db. Have to keep 3 different db's in mysql. However Kodi 18 no longer runs in a VM properly (has to do with graphics drivers) so I would have to figure out an alternative to move forward. There are also issues with profiles. Looks like the master profile gets loaded when you log out. This can be a bit annoying with the pvr stuff as when you login to another account it first has to wait on the pvr to shutdown just so it starts up again. There is a delay at logon. Also any other plugins are also now loaded at the logon screen. It has been reported and apparently nobody available to work on it. The kodi team is small and works pretty hard as it is. The retroplayer and drm updates are big. I really want to use them, but the issue above I just can't work around. I'll just have to wait until it gets fixed eventually. Hi, thanks, interesting this docker ! For your problematic you should really try to associate your Kodi with a plex server. the management of 3 profils with 3 different "watched status"
I think it can manage PVR too but I never test this functionality. You let Plex totally manage your medias, it makes very good scrapping too, you create 2 accounts as invited friends. After on Kodi you install the add-on PlexKodiConnect , you follow the wizard and you're done. I run like that since 3 months : it will better if it was only Kodi technology behind but I admit that it is a pleasure ! There is a long ongoing thread on the headless topic but as was mentioned earlier in this thread it's not a priority for the very limited dev resources that we have available (at least currently). Kodi isn't designed to work that way, it's more for running on devices directly plugged into the display (or latterly on some displays themselves directly). The client/server model is of course what Plex uses, and that aim is I think what lead to its creation in the first place (as if you go back far enough Plex is a fork of Kodi/XBMC). The point is we're not trying to outdo or "beat" either Plex or Emby - we're happy to co-exist with them and for people to pick and choose the solution(s) they want that best suit their usage cases. Personally for example I use Kodi at home for my media needs, but when travelling I use Plex on a Firestick. Works fine and fits well in both applications. 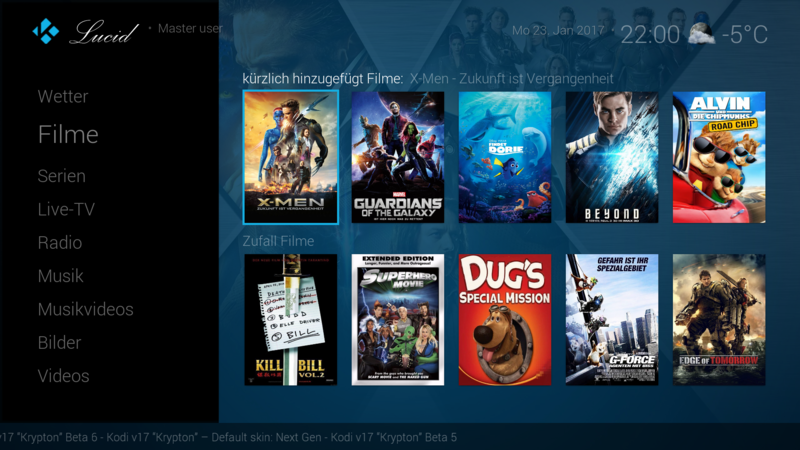 (2019-01-30, 18:48)schmurtz Wrote: For your problematic you should really try to associate your Kodi with a plex server. I've been looking at this recently. Just haven't dove right in. Like you though I wanted to keep it 100% Kodi. Every few months I take a look at plex and emby again. They just aren't up there with Kodi. Yes they are simple and have their strengths, but things like IPTV integration still needs a lot of work and customizing it is very limited. I've been using Kodi way to long. (2019-01-30, 18:58)DarrenHill Wrote: There is a long ongoing thread on the headless topic but as was mentioned earlier in this thread it's not a priority for the very limited dev resources that we have available (at least currently). ... But when you come back from holidays and you see these movies that you watched during your holidays which are not marked as viewed it is a little frustrating, isn't it ? What I mean is if a feature tend to become essential to the ecosystem and this feature is not open source and may be not free one day ... wouldn't it be interesting to anticipate and start integrating these features natively ? But what do i do whet i see how many channels i have, but the ckient won`t download it? Kodi 18.0 does not play DVD, Kodi 17.6 play! How to disable the Kodi update? Kodi itself doesn't update, at least across versions like that. But there are external apps and services (e.g. the Google Play Store and the Windows AppStore) which will unless you disable it in them. But as you don't say what OS or device you're running Kodi on, then we're not able to advise in any more detail. (2019-02-03, 13:58)Hombrus Wrote: Kodi 18.0 does not play DVD, Kodi 17.6 play! How to disable the Kodi update? Just updated to kodi 18 stable and, video playing on all 1080p stutters a lot if mediacodec surface is disabled. Please don't spam your findings via double-/crossposting on this forum. Stick to the thread you already used here.